Written By: Lynn A. Wood, M.A. CCC-A, LSLS Cert. AVT. If your child with hearing loss has middle ear fluid, this is a call to action for prompt and aggressive management. The presence of fluid or infection in the middle ear space behind the eardrum may prevent your child’s access to sound. Of course, hearing loss of any type and degree blocks the doorway to get auditory information the child’s brain, but even fluid alone can fluctuate and cause 5dB to as much as 40dB decrease in hearing (Estabrooks, et. al., 2016). Couple this to a pre-existing loss and a moderate hearing loss can become severe or profound. Persistent middle ear fluid has negative consequences on auditory, spoken language and cognitive development. Last week, Marge Edwards shared her story about her son’s experience with middle ear fluid. 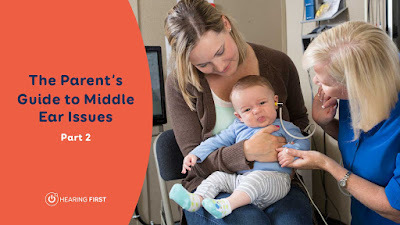 The big takeaway is that middle ear fluid is common with estimates that 75% of children experience at least one episode by their third birthday. And, almost half of these children will have three or more ear infections during their first three years. In fact, children who are not breastfed, those attending large child care centers and living in homes with smoke present (cigarettes, wood stoves) are more likely to experience repeated ear fluid or infections. Many children with Otitis Media with Effusion (OME) also known as middle ear fluid, experience chronic recurrence and with accompanying colds or allergies, can have middle ear fluid for many months of the year. Any decrease in hearing caused by fluid means poorer auditory access and has detrimental effects on a child’s spoken language development. This can significantly affect listening and spoken language outcomes for children with hearing loss! How can you and your LSL professional team work together? You will need to work closely to monitor your child’s hearing status. A positive LSL outcome requires that you stay the course in monitoring your child’s hearing status through daily listening checks and performing the Ling Six-Sound Test. Share any change in your child’s responses with the members of your LSL professional team. The journey to listen and talk requires a team committed to monitoring, treating and addressing the causes and symptoms of middle ear fluid. Don’t wait!